Yesterday was a blast at the TKD tournament and then today there was awesome sparring training with Master Suarez who was visiting from Queens, New York. 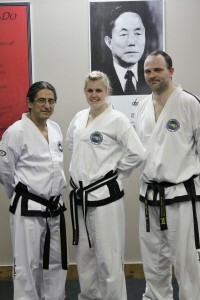 It’s just an honour to be coached by such high ranked instructors. I met Master Suarez in Halifax last October at the IIC (International Instructors Course) so I was excited to see him again since he has so much energy and he produces great fighters. The seminar covered movement in the ring and detailed footwork. For the first two hours we did nothing but work on offensive and defensive footwork and movement. Our feet were burning from sliding on the mats for so long. Like so many other sports you have to start with the footwork (the ground work) and work your way up. It wasn’t until the final hour that we actually did any kicking which just goes to show how important the foot speed is. The drills were basic, but then when he added specific footwork, your cardio was being tested and your brain. I can really see how they will make a difference. Boxers shadow-box by the hour to get their footwork right, soccer players spend hours dribbling the ball for better control and I spend hours working on my footwork with javelin training before I even throw. You have to be willing to work on the ‘basic fundamental’ stuff if you want to improve. We were all dying of exhaustion after the three hours (plus already being sore from yesterday) but I didn’t want the training to end since I was learning so much. I look forward to training with Master Suarez again sometime hopefully this summer and he invited me to a big tournament in New York next September. Thank you Master Suarez for an incredible Sparring Seminar and thank you Mr. LeGrow for making it possible.